so i guess that's why i started two new quilts this week. my house is defnitely a mess, but oh well. it feels like i should be on vacation or something. 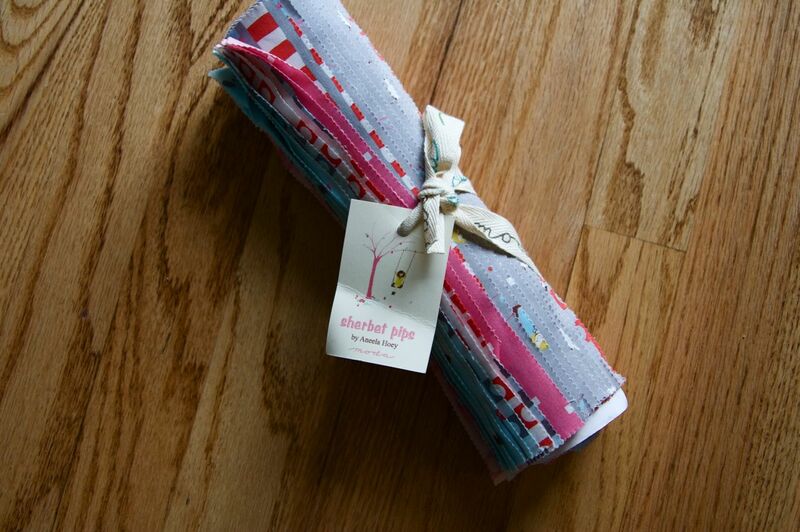 i was lucky enough to get some sherbet pips months ago, designed by my blogging buddy, aneela, and have been debating what to do with them. i think i'm finally set on half square triangles. I discovered a new method for half square triangles, and it's awesome. the tutorial is here, check it out. it's pretty genius. I'm planning to do a value-type quilt. I think. and then i decided to make some more houses. i am loving them lately. totally inspired by the house expert, krommama. I saw that a while back and tried it. I was not a huge fan of the bias edges but she has a ton of great tutorials on youtube. Oh I love those houses, I have to try more free-style piecing, mine always just look wrong. I love those scrappy little houses, very sweet. I just love those Pips! April is just too far away! I LOVE your houses! That might be the best fussy cutting I have ever seen! wow- that is a crazy fast way to do HST! oh for PIPS! Want, want, want =) I'll enjoy watching your quilt come to be. omg fantastic! i am so in love with the pips i can't even stand it. your houses are LOVELY!! Love the tutorial - how awesome is that! And your houses are just so adorable - love them!! Your little house people are killing me with cuteness! After seeing your potholders awhile ago, I just HAD to track down some of that Apple pie kids fabric. CUTE houses! I will definitely add those to my huge 2011 sewing wishlist. 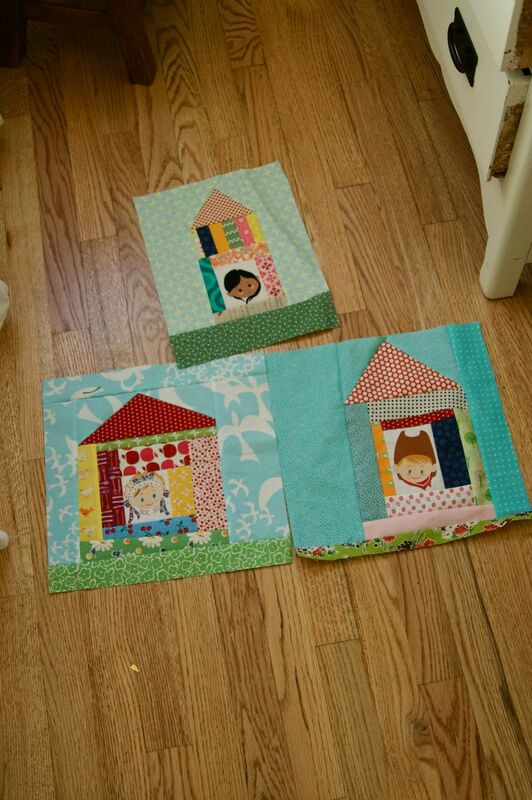 Those house blocks are just adorable! I too am patiently awaiting Sherbet Pips to be made available!! Great idea, but what about all those bias edges? Darling houses! Love the little faces you used as block centers looking out. These Sherbet Pips are so darn adorable! 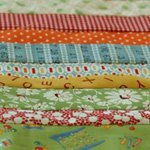 I was lucky to grab a jelly roll from an etsy shop, but I can't wait to get more. 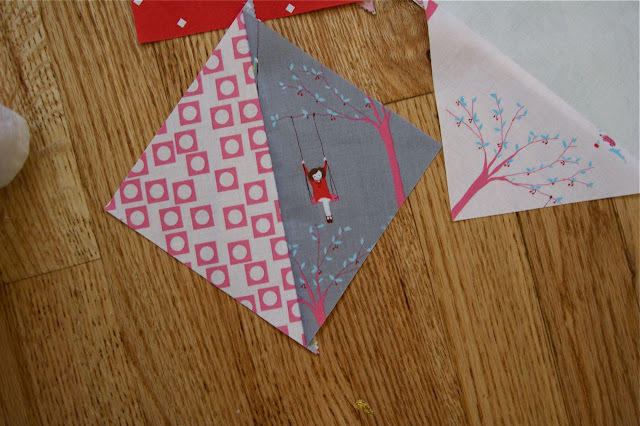 I absolutely love love love that cool technique for sewing HST - thanks for sharing that! Genius! Adorable house blocks! I still owe you one which I'm going to make this weekend. Happy New Year! That HST tutorial IS genius! Makes me want to go make a value quilt right now! ack! thanks for the link to my flickr page. you gave me a big smile. i love those sweet little girls in your houses. so fun! I have a charm pack of Sherbet Pips (love, love!!!) Not sure exactly what I'm going to do with it. For now I'm just looking...and looking at all the cute prints. And your houses are adorable beyond words! Love that range of fabric, your triangles look great - along with your houses. i'm so going to try this. thanks for the link! i love your houses, too. Those houses with cowboys are adorable. So pretty! Clever tutorial. I checked it out (plus a half dozen other ones from the same girl), thanks for sharing! Thanks for the linkie love. I'll have to try out the hst tutorial. I always recut, so I don't know if it would save me time. Cute houses, I've been wanting that kid fabric forever. Thank you for a great link - I'll be sure to try this one out! Oh my gosh the houses are so incredibly cute. Love them. I love that fabric line pips. I watched the HST tutorial -- brilliant! I was thinking of making my next quilt a HST one, but didn't want all of the tedious work. This was fabulous! Thanks for sharing. Love your houses! The fussy cutting in the windows just makes them. Love the houses too! 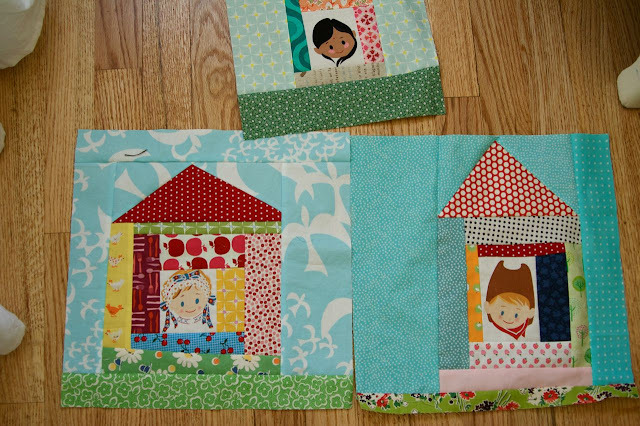 I make quilts for the sick and these would be so cute for children! Definitely going to make some of these. Love what you are doing with the pips!!! I NEED to make one of those HST quilts too! Oh and the houses - too cute! The houses are awesome with those kiddieheads in them! Those houses are as sweet as! Tes maisons sont superbes ; bravo ! Oh brilliant! I love HST, and I love pinwheels. Adorable houses- my goodness. And Sherbet Pips...I can't wait! I love those houses, very sweet. That might be the best fussy cutting I have ever seen! 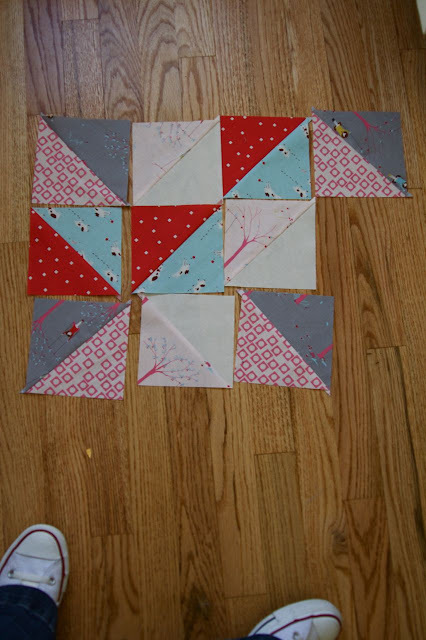 So did you make HST using the 10" squares or did you cut them down to 5" squares to start?? Thanks for the link to the tutorial. Did you have any issues with the bias edge?? Commenting way past the original post date, but I had to say thank you for the link on the half-square triangle how-to video. That is the easiest way I've seen to do them. I've always been intimidated, but not now! So thanks! Have been having a blast looking through your blog at all your lovely quilts.